I received this email today from a concerned local. Please everyone, there are other products out there that do not poison the environment and contribute to bad health. Even COSTCO is selling non toxic alternative, "Burn Out". Let's help our neighbors to understand the bad affects of using this cancer causing product. It took me 4 years but my neighbors don't want their grand children's health to be at risk so they switched this year. The biggest user is still the wine industry and they have no shame using over 78,000 pounds of concentrated glyphosate a year and gleefully call themselves "Sustainable Sonoma". My name is Rosa G. and I'm a neighborhood resident close to your facility. A couple of weeks ago I was driving home and noticed a golf cart spraying under your sign on Hessel. I also noticed your driveway is sprayed as well. I'm curious if you use Round-Up, and if so, am hoping you'd consider not-toxic alternatives that are just as effective. These alternatives (unlike Round-Up) are safe for the environment, the ecosystem, children, and native animals. Your facility looks like a lovely and inviting place, and I'm sure your guests would also enjoy a toxic-free environment along with your neighbors. Below I've attached some pertinent articles related to Round-Up, and toxic-free alternatives. Would please let me know how your weed control plans for the future either way? I know of some potential guests who might enjoy staying at your facility. Last edited by Barry; 04-03-2019 at 12:50 PM. Very nice way to suggest discontinuing the use of RoundUp. Just wish this 'progressive' county would just outlaw it. But our supervisors are deep in the pockets of the grapists who do, indeed, almost all love RU. I received this email today from a concerned local. Please everyone, there are other products out there that do not poison the environment and contribute to bad health. Even COSTCO is selling non toxic alternative, "Burn Out". Love the "grapists" reference! Yes, water, our health, quality of our lives for their profit. ... But our supervisors are deep in the pockets of the grapists who do, indeed, almost all love RU. Page 9 of "A Guide to Pesticide Regulation in California", issued by the State, says that counties in California do not have the legal authority to ban pesticides, So, perhaps, "supervisors ... deep in the pockets of the grapists" is not the reason Glyphostae is not banned in Sonoma County. But the phrase is catchy and has a nice cadence and ring. I like your term "grapists," which is appropriate. Yes, indeedy, it's The American Way! but it is killing the Soil Microbes as well. And it is already in our Bodies. But what can you do, to get De-Toxified, of the Glyphosates, in your body right now? Last edited by Barry; 04-06-2019 at 01:17 AM. I read somewhere that Glyphosate was detectable in every vegetable except broccoli and one other which I forget. Many articles on 96-98% of all human urine contain this cancer causing toxin residues. How do we embarrass the wine industry here into stopping this practice of widespread spraying? According to the California Dept. 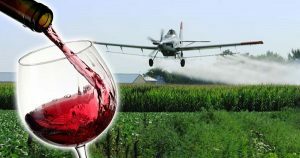 of Pesticide Regulation, the wine industry is the number 1 user with landscapers a distant second. I'm so tired of them whining about how much money they bring into the county. No excuse to poison us all for their bottom line. Most of that money goes to the elites of the county and the rest get mediocre jobs and have long commutes or multiple jobs to live here. Do you remember when the industry wanted aerial spraying? Turned out that was NOT needed. Thank people like Shepherd Bliss for stopping that one. What about the health problems and suffering they are causing. 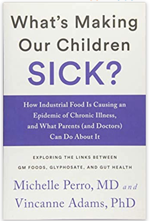 See: "What's making Our Children Sick" by local doctors Michele Perro and Vincanne Adams. Oh yeah, the wine industry is "sustainable"....what a joke. While I'm no fan of Glyophospahate .. or Monsanto (now owned by Bayer? ) ....as someone who had a certified organic farm for well over a decade, and have also been involved in the organic cannabis industry... I'm going to play devil's advocate. We seem to love to harp on the wineries here- but TBH, as in almost all commercial agriculture - the bottom line matters. There is an incentive to use as little of a product that costs you money (the product, the application, the paperwork, the storage etc) as possible. And, applicators on farms are trained and licensed. They know how to read the labels. Mix properly. Apply at proper times to avoid runoff. And try and save their employers $ while getting the job done. These farmers also tend to religiously use cover crops, mulch, and compost (at least until some NIMBY folks got Sonoma Compost shut down) to minimize the need of a weedkiller in the first place. While I don't think ANYONE has numbers... just looking at the shelves of every hardware store in the county... I would argue more roundup is used by homeowners and small businesses then the wine industry. And often applied with the normal American mentality of more must be better. And often with no thought as to the time of application to prevent runoff from rain or irrigation. And certainly without observing the "re-entry period) that ag observes- letting everyone from people to pets onto the applied areas... and thus tracking into it homes etc. And to be clear- "organic" and "natural" does not mean safe... nor even safer. There have been quite a few major studies in the past years that call into question how much better "organic" chemicals are. Organic pesticides, herbicides, and fungicides tend to be both very broad spectrum... and somewhat ineffective. Which means they ultimately get applied much more frequently than chemical options... and tend to kill or harm a much wider spectrum then many chemicals do. And many of them are rather slow to breakdown and are very toxic if they enter waterways. And I can attest from use- it is moderately effective...against some weeds. Requires many applications and is worthless against some common weeds. I'll also say in an earlier thread people were suggesting vinegar. Do your research- this popped into popularity in the late 90's (or early 2000's). It "works" by changing the soil pH to a level pretty much nothing to go. I know OR & WA (and probably CA) jumped on the bandwagon at the time... then quickly banned its use because of its devastating effects on the soil AND waterways. Sorry... I'm just kind of tired of the world as it is right now. *We* are right and *they* are wrong. The truth is much, much more complicated.... and we're all seemingly too willing to overlook the inconvenient truths of our position. Last edited by Barry; 04-08-2019 at 08:52 AM. I remember those days when they were threatening our homes and farms with spraying us from the air. We went to the Board of Supervisors and let them know that they would do so "over our dead bodies." We were able to cancel those flights. We are once again in such a time when we food farmers and our allies need to stand up to those addicted to wealth. Enough is enough! Life is not all about money, though having enough to survive is important. Wine is a boom and bust industry. It seems to be in decline here in Sonoma County, as the millennial turn away from wine. Homeowners are a drop in the bucket. Please educate yourself on the amounts of regulated toxins our society finds acceptable to allow corporations to plunder for profit. The California department of Pesticide Regulations: https://www.cdpr.ca.gov has a data base of all chemicals used in our County and who uses it. Of course homeowners are not required to report their use but everyone else is. So it takes a few applications for glyphosate alternatives to be effective, would you rather have cancer or give it to others? I am in total agreement about sulphur, considered organic but used in unbelievable amounts here (well over 2 million pounds a year here). Very little stays on the target but ends up changing pH of water, soil etc. Vinegar is NOT a threat. When used with orange oil and or Dawn dish soap and other formulations used by local farmers like Kathy Tresch, it is effective and is not causing cancer or destroying the environment as you suggest. 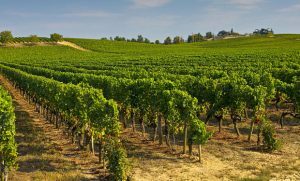 The wine industry is in decline with grape glut and rapidly falling sales so what will the next crop be? Hopefully something more worthwhile than alcohol. As a society we need to change our way of thinking about acceptable levels of harm to allow extractive businesses to flourish while the public and environmental health plummets. Permitting environmental degradation is what our regulatory agencies are doing now. "The permitting agency is in the business to facilitate the issuance of a permit, NOT to protect people." CELDF. Wow have we gone down the rabbit hole. Last edited by Barry; 04-08-2019 at 03:54 PM. Cancer rates for kids highest in the state Napa, 3rd Sonoma. As far as sulfer being sprayed I was told that sulfur has poison added to it, but it is so minimal they don't have to put it on the labels. Yes, our water is being poisoned, wines and beers and teas probably should not be consumed if our groundwater is used. Your supervisor L. Hopkins has been instrumental in creating a new agency to monitor our water called the Santa Rosa Plains Groundwater Sustainability Agency, Because a few of us see that this is a very greed driven board, we have formed the Rural Homeowners Alliance to tackle this and many other issues to keep water clean and our public trust, not up for grabs by the rich and profit driven industrial agriculture. Last edited by Barry; 04-09-2019 at 09:49 AM. City of Sonoma bans Glyphosate products in public landscaping !! Just last Monday, the Sonoma City Council voted unanimously to ban the use of glyphosate-based products (such as RoundUp) in city landscaping. That means that the historic Plaza, city parks and bike paths, etc. will be a little safer for residents, visitors, families, workers, pets, and the birds and bees! Though the Council did yet enact a full ban of toxic synthetic pesticides, as SCCA had advocated they do, we do expect them to bring the issue back for a vote this Spring. Keep paying attention and speaking up, Sonoma residents! Sonoma joins Santa Rosa, Sebastopol, Windsor, Healdsburg and Petaluma that have passed full or partial bans of glyphosate and other synthetic pesticides. Next up for our Toxic Free Future campaign are Rohnert Park, Cotati, Cloverdale and the County. Let us know if you want to get involved!! Annie is the political director of the North Bay Organizing Project (NBOP) in Sonoma County, CA, and Shannon is the co-founder of Movement Rights. Sonoma, County California is the California Dream. Majestic Redwoods. Rugged coastline. World class dining. Affluence. The Good Life. And 425 wineries in an idyllic country setting. The myth of the Northern California wine country lifestyle hides the secret behind the wine bottle: huge agribusiness as a political machine, mono-cropping replacing forests and woodlands, cancer clusters and pesticides poisoning the land, water, farmworkers and community. 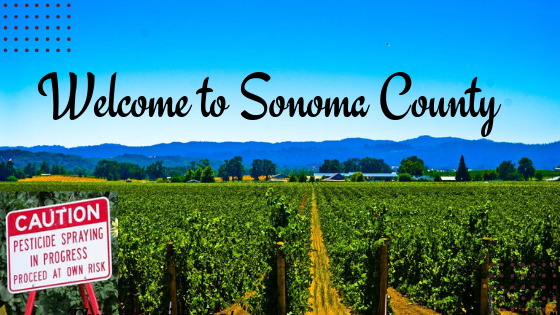 More than 60,000 acres of Sonoma County are industrial mono-cropped vineyards. Of these, only 600 acres are organically farmed—that is less than 3%. The rest are heavily sprayed with toxic chemicals that poison the farm workers who work the vineyards, the people who drink the wine, and the communities who rely on the water that these chemicals contaminate. As industrial vineyard acreage increases and climate change makes other wine growing regions less desirable, there is a push to clear cut forested areas and turn them into vineyards. These industrial vineyards use a tremendous amount of water, and often are accompanied by water mining which is depleting Sonoma County groundwater. Sixty percent of the children of farmworkers in Sonoma County have asthma. Sonoma has the third highest rate of childhood cancer in California. And that was before the fires. Recent studies have linked glyphosate, a chemical component found in RoundUp (which drenches Sonoma County’s fields, and flows into rivers and groundwater), with autism. And used in combination with other dangerous pesticides including Mancozeb (a developmental toxin and probable carcinogen), the residents of Sonoma County are being poisoned. Rachel Carson led the way to ending the use of DDT and the poisoning of insects, animals and people with the publishing of SILENT SPRING back in 1962. We can do it again!!! And let's start right here in Sonoma County. And, speaking of Rachel Carson. you might want to know... glyphosate in your drink? Neurology paper - how Glyphosate (found in Round-Up) makes us sick.